Makes: Makes about 9 cups. 1Peel squash. (Microwaving one whole squash at a time on high for 2 minutes makes peeling easier.) Cut in half and discard seeds. Chop into small pieces. Finely chop onion. Peel apple, then thinly slice. 2In a large saucepan, melt butter over medium heat. Add onion and apple. Cook, stirring often, until onion begins to soften; about 5 minutes. Add broth, cream, squash, sage, cinnamon and salt. Cover and bring to a boil. Reduce heat to medium-low and simmer, covered and stirring often until squash is very tender, from 20 to 25 min. 3Ladle about 1/3 of soup into a blender and whirl until puréed. Pour through a sieve, using the back of a ladle to press soup into a large bowl. Repeat with remaining soup. Pour strained soup back into saucepan and set over medium heat. Stir in maple syrup and add more broth or water if it needs to be thinned. Stir until hot. 4Ladle into bowls and top with a generous dollop of whipped cream or sour cream and slivers of apple, if you wish. 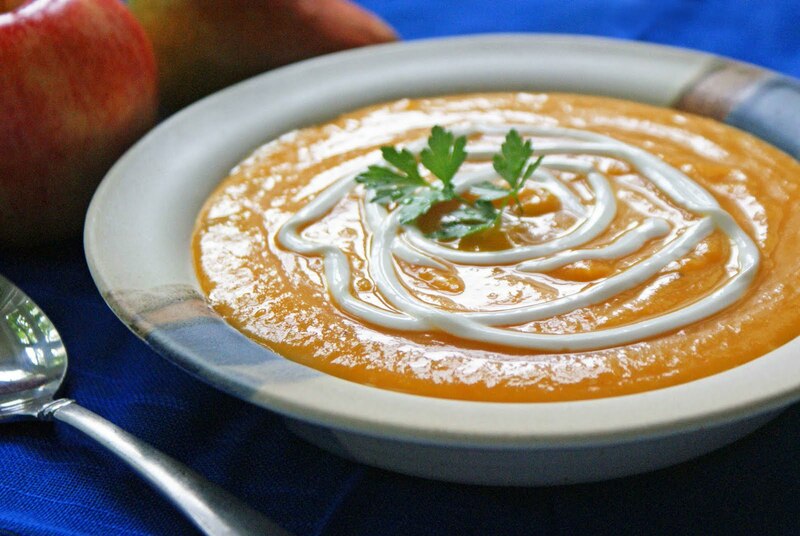 Soup will keep well, covered and refrigerated, up to 5 days or freeze up to 3 months.